Songkran, informally called "the Thailand water festival," is an annual event marking the start of the traditional Thai new year. Songkran is the largest celebration in Thailand and is notorious as the wildest water fight in the world. Laptop, smartphone, passport...don't think that you're somehow exempt from good-natured splashing no matter what you're carrying or wearing! Plan to get wet and stay that way for at least three days if you're anywhere near the celebration. Fortunately, getting wet during Songkran coincides with scorching temperatures in April — the hottest month of the year. What Is the Thailand Water Festival? Officially known as Songkran, the Thai water festival is about cleaning, purification, and having a fresh start. Houses are cleaned; Buddha statues are carried through the streets in a procession to be washed with flower-scented water. Elders are honored by respectfully pouring water over their hands. In places such as Chiang Mai, you'll get to enjoy seeing a long parade of Buddha statues carried through the gate. Ordinarily, viewing each image would require visiting dozens of spread-out temples. 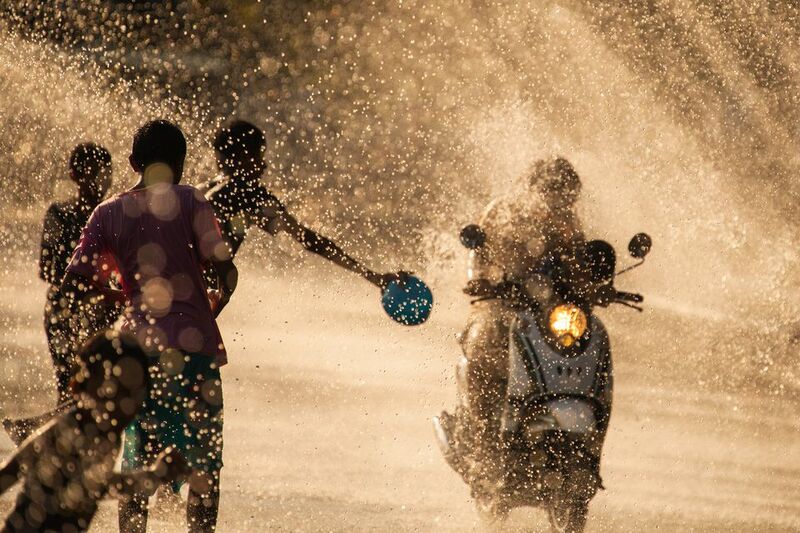 Although the true Songkran tradition is to sprinkle water on people, travelers and locals alike don water cannons and buckets to take the "blessings" to another level! Dousing or sprinkling people with water signifies the washing away of bad thoughts and actions. It brings them good luck in the new year. Sometimes firehoses are used to really spread the good blessings! As formal processions and formalities end, a throng forms in the street to dance, party, and throw water in good-natured fun. Think Mardis Gras with a water fight. To up the ante, many Thais add ice to their water. They form gangs and teams that wear masks or bananas while wielding large water cannons. While Holi in India can probably claim the title for the messiest festival, Songkran in Thailand is certainly the wettest of festivals in Asia. Don't worry, you probably won't mind the drenching. Afternoon temperatures in April (Thailand's hottest month) regularly rise above 100-degrees Fahrenheit. Songkran was once based on the lunar calendar, however, now the dates are fixed. The Thailand water festival officially runs for three days starting on April 13 and finishing on April 15. Opening ceremonies begin on the morning of April 13. Although the festival is officially only three days long, many people take off from work and stretch the festival into as long as six days — particularly in tourist places such as Chiang Mai and Phuket. Check guest reviews and prices for Chiang Mai hotels on TripAdvisor. Warning: Be ready early! Excited children may douse you (and your smartphone or passport) days before the official start of the festival. Although the epicenter of Songkran is around the old city moat in Chiang Mai, you'll find massive celebrations in Bangkok, Phuket, and all other tourist areas. Smaller towns and provinces may celebrate in a more traditional manner with the focus being on temple activities rather than drunken revelry. For a more traditional experience, consider visiting Isaan — Thailand's largest region in the northeast that receives fewer tourists than it should. Songkran is also celebrated with gusto in Luang Prabang (Laos), Burma, Cambodia, and other parts of Southeast Asia. Chiang Mai is certainly the place to be for the wildest water festival celebration. Nightlife rages that week. Expect huge crowds and gridlock traffic around the Old City moat. Tha Pae Gate will be the epicenter, with people using the moat or hoses provided by bars to fill their buckets and water weaponry. Transportation from Bangkok to Chiang Mai gets very busy in the days leading up to Songkran. You'll need to arrive days in advance to find accommodation within the Old City near the action. Book your departure ticket early if you expect to leave directly after the celebration. Authorities drain the rancid water from the moat and refill it with cleaner water before the festival begins. Regardless, the water is anything but potable, and you'll probably end up swallowing a fair amount by accident. Make sure your travel vaccinations for Asia are up to date! Water-borne viruses such as conjunctivitis (pink eye) and stomach problems are common after the festival. Don't throw water after sundown. You'll see people doing it, but they are in the wrong. Don't splash monks, pregnant women, or babies. Don't remove your shirt or dress indecently. During the 2016 Songkran celebration, a British man was arrested for taking off his shirt! You will get wet — very wet! In fact, unless you barricade yourself inside the hotel room, don't plan to be dry during daylight hours. Only monks, the king, and pregnant women are exempt from being splashed. No matter how much you plea or what items you are carrying with you, you could be attacked by the hotel staff with water as soon as you exit your room. Songkran has claimed more than its share of cameras and phones. As mentioned above, either waterproof everything or leave all valuables at your hotel. Accommodation and transportation in Chiang Mai reach full capacity. You need to arrive early for any hope of finding a place to stay near the action. Don't go barefooted. Despite efforts to ban bottles, broken glass ends up everywhere. Drunken revelry is a big part of the Thailand water festival. Expect hordes of people dancing and drinking in the streets. The local government in Chiang Mai has cracked down more and more on drunken behavior in public. You could be fined. Do not drive a motorbike during Songkran! Road accidents and fatalities — already very high in Thailand compared to other countries — more than double during the water festival, mostly due to drunk driving. Foreigners driving on motorbikes are not exempt from getting splashed. In fact, they are often targeted! Songkran is about fun and good karma in the new year! For some reason, carrying a large plastic water gun seems to embolden people. Don't be one of the jerks who uses the festival as an excuse to act like a bully (e.g., splashing people at night or shooting indoors into businesses). The usual rules of Thai etiquette still apply. Don't cause others to lose face or become embarrassed because they saw you lose your cool in a water fight. Keep a good attitude! Fun-loving Thais and tourists are going to splash you with water — don't get mad or feel singled out. The wet mayhem is part of the celebration. Don't go if you do not plan to participate. Either get a bucket — there will be many around for free — or negotiate to purchase a water cannon in the market so that you can join the fun. Tie a string onto your bucket so you can fill it from water barrels faster. Although rowdy places such as Khao San Road in Bangkok may be an exception, typically the splashing stops at sundown when temperatures drop slightly. Even still, some revelers will still attempt to splash you after sundown. Be safe. Drunk driving is a serious problem during Songkran. Pedestrians are regularly hit by vehicles. Be careful when crossing the road or while standing at intersections. Although the water splashing is fun for everyone, remember that Songkran is actually a religious festival. Stay out of the way of worshipers at temples and shrines. If you visit a temple, show due respect. The traditional way to wish someone well at Songkran and to make peace after splashing them is with sah-wah-dee pee mai which basically means "happy New Year." You can say this as a basic greeting during Songkran or after you say hello to someone in Thai. More than likely, you'll also hear suk san wan Songkran (pronounced: suke sahn wahn song kran) which means "happy Songkran day." Along with sprinkling or throwing water, a few local people may be smearing white powder or paste on others. The paste is usually brushed gently on the cheeks and forehead. Symbolically, it wards off bad luck. Don't worry: The paste should be water soluble so it won't stain clothes. Another old Songkran ritual is to tie blessed strings (sai sin) to people's wrists. If someone approaches you with a string held from end to end, extend your wrist with the palm facing the sky. They will tie on your new bracelet (they're usually thin, cotton strings blessed by monks) and say a short blessing. The tradition is to leave the strings on until they break or fall off on their own. If they become too nasty to wear, try to untie them rather than cut (you don't want to break the good luck). Wearing colorful clothing is a tradition during Songkran. Tourists and locals often wear vividly colored, flowery "Songkran shirts" to celebrate. You'll find plenty of tacky Songkran shirts available for cheap. You can't! Unless you hide indoors for three days, you can only lessen the soakings by going somewhere rural where water is sprinkled more so than thrown. Even then, in places with fewer farangs (foreigners), you may be seen as a priority target. Yes, constantly having water—sometimes chilled with ice—dumped over the head can test one's patience after the second or third day. Forget trying to sit, read, or work in any open-air establishment. The ultimatum is straightforward: If you don't want to get wet or join the chaotic celebrations, don't go anywhere near Songkran! Either plan to join the fray and have fun or wait out the celebration somewhere else. When Are Thailand's Full Moon Parties?